The colors are as shown and I especially love all the texture the rug has. It's a good weight as well. Planning to order a larger rug in the same style! I was very worried about ordering a rug without seeing it in person but the rug is very soft, light, and perfect for my kitchen. This area rug is even nicer than pictured and fits perfectly in my bathroom. It has an interesting combination of weaves and the muted colors make it very versatile. It's also soft and comfortable to stand on, which is important in a bathroom. So happy with this rug! I love the neutral colors and I want to buy it in other sizes! I love the colors of this rug. Its very warm and cozy looking. Well made as well. This rug adds so much to my master badroom. Everyone is complementing this rug. Love , love love this rug. Rustic and different. Just beautiful. The colors are perfect and makes me entry look warm and inviting. I highly recommend! Rug is nice and colors are soft, but It probably would be hard to vacuum since it has some portions sticking out high. It is not wool but rather combination of wool and cotton. Love this rug!! Perfect mixture of colors. The rug is nice and plush, pretty thick. I'm interested to see how the varying pile height will hold up against vacuuming though. The colors and details are accurate and the edges seem sturdy like they won't get chewed up by the robot vacuum. 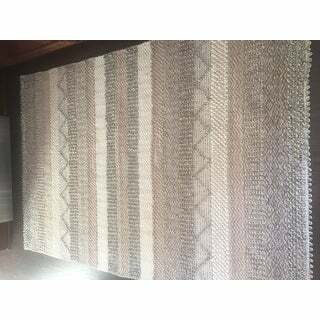 It is a beautiful rug, gorgeous neutral colors. 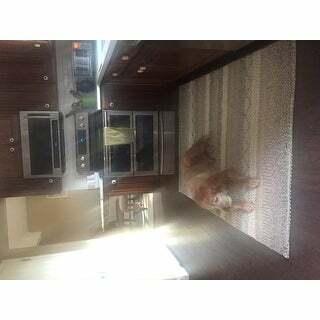 It is great quality for the price, very comparable to more expensive rugs. Fast shipping, easy to lay out. Lumpy and "rough" looking. Had to return. This rug is awesome. I thought it would have a blush pink tone in it but it doesn't. Even though is is beige, cream and grey it still looks good. It has a nice texture and weight. Lays nicely, like the colors. Nice rug, neutral colors to go with a variety of décor. We strongly advise against washing this rug. Routine vacuuming is the most important step in maintaining the life and beauty of your rug. It is recommended that you have area rugs professionally cleaned every 1-2 years to remove deep set dirt in high traffic areas. Otherwise, attentive vacuuming will significantly extend the life of area rugs. "Does this rug come in square sizes?" "Is the color of this rug beige and gray? Does the beige have any yellow or gold tone?" This rug is a beige/ grey color. There does not look to be any instances of a clear yellow. Please note colors may vary slightly due to dye lot variation.